A homeowner in Coral Gables’ historic district trusted only Perkins Roofing Corp. with the re-roof of their home. The home, a historic structure that required special permitting and for Perkins Roofing to seek permission from the HOA board prior to beginning roof construction, is a two-story home with a guesthouse. The homeowner chose Alhambra handmade clay barrel tiles to compliment her home’s style all while protecting the Polystick TU Plus tile underlayment system fromPolyglass® underneath. Special circumstances Perkins Roofing roof technicians experienced were working with an open beam ceiling which requires using shorter nails so they don’t show through the wood deck and removing trash from the roof with limited access to a dumpster. 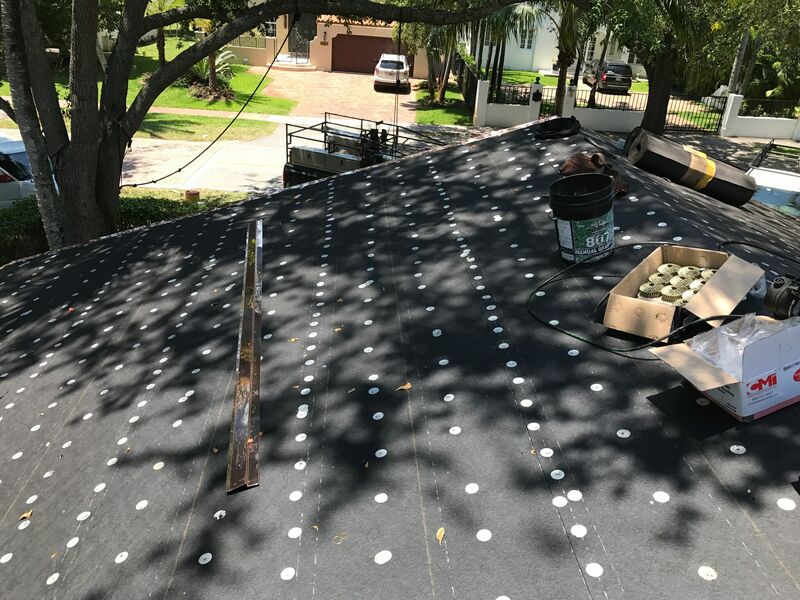 The newly completed Coral Gables re-roof is backed with a Perkins Roofing 10-year warranty and a 20-year Polyglass warranty for material only.